Our free buses are running continuously to offer you a quick and efficient service. By providing your correct flight arrival time and flight number you will help us to help you. 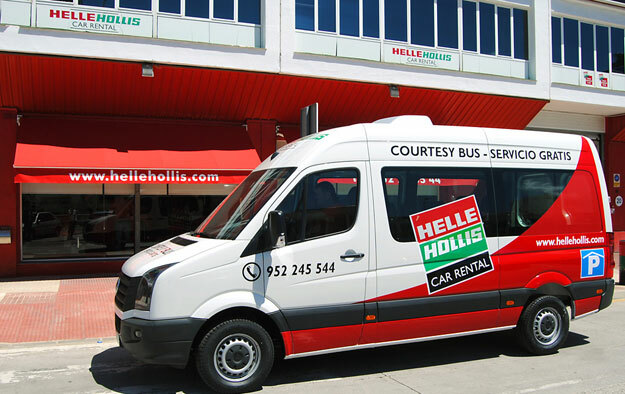 Free courtesy bus service from Málaga Airport to the Helle Hollis Head Office which is only 800 metres away from the Airport. Leave arrivals by the main doors then go to the right for about 50 metres. In front of the taxis the roadway is covered, follow the pavement to the right for about 30 metres. Follow the pavement for approx 100 metres to the courtesy bus stop. Wait by the sign saying "shuttle bus/ courtesy bus/ bus de cortesía". 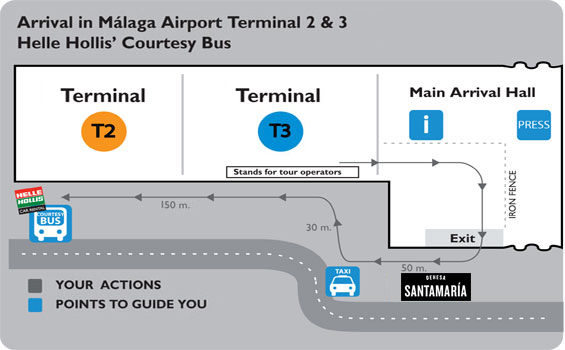 Flights may arrive into Terminals 2 and 3 but ALL passengers leave via the new Terminal 3 building. When you have collected your luggage you can send us an sms to + 34 638 444 690 with your last name and we will reply by sms to let you know that we are on our way. Please note that the mobile phone number can only be used for sms and not to call us.